ExxonMobil, a frequent target of climate activists, is pledging to significantly reduce its greenhouse gas emissions. The world's largest public oil company on Wednesday detailed plans to cut methane emissions by 15% by 2020. Methane is a powerful greenhouse gas that scientists blame for contributing to global warming. Exxon (XOM) further pledged to cut flaring by 25%, led by significant reductions at the company's operations in West Africa. Flaring, the burning of excess natural gas at oil wells, is a significant source of greenhouse gas emissions. Exxon CEO Darren Woods described the methane announcement as part of the company's "longstanding commitment to improve efficiency and mitigate greenhouse gas emissions." Operational improvements, including efforts to detect and repair leaks, have already cut methane emissions by 2% over the past year, Exxon said. Future programs to cut greenhouse gas emissions will target Exxon's refining and chemical manufacturing facilities. The move follows years of climate pressure on Exxon from shareholders, climate activists and governments. Major cities including San Francisco and New York have recently filed lawsuits demanding Exxon and other oil companies pay billions to cover the costs of protesting their cities from rising sea levels caused by global warming. Andrew Logan, director of the oil and gas industry program at sustainability nonprofit Ceres, said Exxon's methane emission pledge is a "good start," but "pales in comparison with the ambition" required for a low-carbon energy transition. Logan's group has for years been pressuring oil companies to address methane emissions. "Addressing methane emissions is one of the cheapest, most effective ways to address climate change in the short term," he said. The International Energy Agency recently said the energy industry could use existing technology to slash its methane emissions by 75%. And the IEA said that 40% to 50% of current methane emissions could be avoided at no net cost. Exxon's announcement comes just a week before it faces shareholders at its annual meeting. Exxon lost a major climate change battle at last year's meeting when shareholders backed a nonbinding proposal calling for the company to disclose the risk it faces from the global crackdown on carbon emissions. Following the rebuke, Exxon agreed to "further enhance" its disclosures on climate change in the near future. 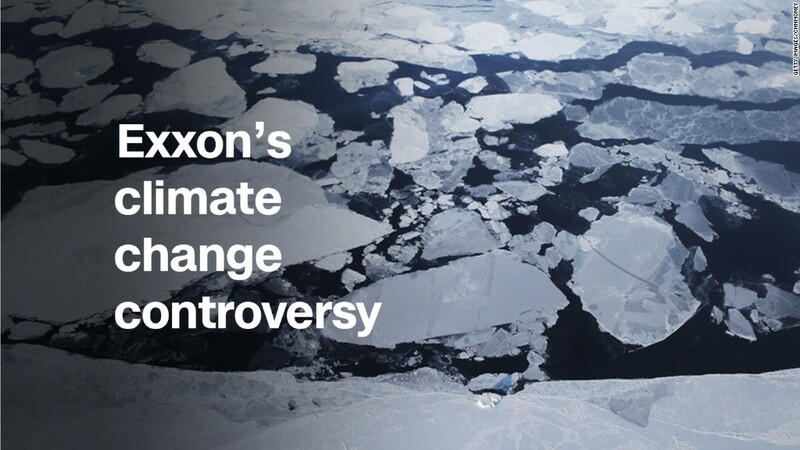 Exxon has also been accused of downplaying what it knew about the risks of climate change. A Harvard University study published last year found that for nearly 40 years Exxon "misled the public" on the growing threat of climate change. Exxon is being investigated by New York and Massachusetts over allegations it concealed climate change risks to the public and shareholders. The methane emissions pledge "reflects the increasing pressure these companies, including Exxon, are under to reduce their carbon footprint," said Brian Youngberg, senior energy analyst at Edward Jones. Other major US oil companies have talked about the importance of reducing methane emissions. ConocoPhillips (COP), the largest emitter of methane among US oil and gas companies, details on its website a program aimed at using existing technology to cut emissions. Major European oil companies have gone further than their US rivals on the climate change issue. BP (BP), Shell (RDSA) and Total (TOT) have all made significant investments in renewable energy, including solar, wind and electric charging facilities. Rather than transforming the nature of its business, Exxon is pledging to make its existing operations cleaner. "It's not a revolution. It's an evolution," said Pavel Molchanov, a Raymond James energy analyst.